Please support the Rocky Mountain Congenital Heart Walk today and help save lives through medical research and patient education. If the legendary Bob Hope didn’t convince you, please read on. Once upon a time I sat at my son’s bedside, hours after a cardiac surgeon told me that the collective “we” were lucky Liam didn’t die that night. Instead of holding my comatose toddler, I held a laptop and through my tapping fingers, pulsing with anxiety, I begged. I literally begged people to help me fund research to keep my son alive. I raised almost ten thousand dollars that spring. Seven years ago, Liam was seven days out from his last open-heart surgery and sixteen days away from his third birthday. That was his last major heart surgery. He endured three more surgeries since then, but none so drastic, so death-defying, so close to the edge of forever. Seven days ago, I sat in a sunny exam room in one of the world’s top five hospitals, currently rated the best children’s hospital in the USA. After three days of tests, many Liam’s never had before, and a parade of the world’s best specialists, Liam was called, “A Rock Star,” by the coordinator of world’s only single ventricle survivorship clinic. He literally couldn’t be any healthier, except for the rhythm things but that’s not bad enough to cut into him for a pacemaker just yet, so we all breathed a huge sigh of relief. The best of the best doctors are impressed by Liam’s extraordinarily good health, and they’ve seen it all. We are so blessed. We are so relieved. Liam’s current cardiac output (with only half a functioning heart) is not only as good as the average child with a single ventricle, it was better. During exercise one of Liam’s rhythm problems dissipated and a second was diminished (guess who’s doing more family walks)! Liam’s heart function was as good as an average healthy child with a fully formed heart. Liam is beating the odds not just by surviving but by thriving. I’m almost terrified to put that in writing. I will always be afraid of getting too comfortable with this good news because we’ve been on the opposite end. I refuse to forget that for every Liam there are kids on the other end of the rock star pendulum – kids who will not be alive at the end of this year. Kids just like Liam will die waiting for heart transplants. Kids just like Liam will get really sick, really fast, and then they will be gone, past the edge of forever. So many have already left, those we knew and loved, those we wish we knew. I never forget that. I never forget them. I know the fragile sands on which we tread. YES! I absolutely enjoy my own little rock star for the next three years before he has to have the same and more invasive tests. I’m lapping up our good news, but I refuse to give up on the kids who didn’t have such great appointments last week. Just because I’m not where I sat in 2006 doesn’t mean I need to stop being vigilant. Just because my own kid is well today doesn’t give me a pass on making a difference for others, it inspires me to do more for them. Ten years ago today – this very day, I sat down to a computer and cast a net to find moms like me – women whose motherhoods balanced on the delicate divide between hope and fear. We were mothers so ravenous for knowledge to sustain our hope that we became immediate family. Last month we had our third parent medical conference in Los Angeles. It was a sort of homecoming where the doctor who first received Liam after his life-flight from Denver to LA spoke to our group. I call Dr. Badran the godmother of Hypoplastic Right Hearts because she empowered me to ask hard questions and not back down until I have answers. Happy tenth birthday HRH! What we learned in California is that the long-term news for kids like Liam and mom’s like me looks grim, right now. Fontans (the series of surgeries Liam had) in older patients are routinely failing. Yet I have hope. I have hope because of the kids and families we met in California. I have hope because of the clinic at Children’s Hospital of Philadelphia. I have hope because, despite his terrifying start, today Liam is a rock star. Amanda-sized hope is not a passive or demurring thing. Amanda-hope is a nagging, pestering, persistent thing that begs you to feed it like a yapping puppy. Amanda-hope can’t be put down. Just one month from now, I’m chairing my final Congenital Heart Walk, something I started in 2010. The Rocky Mountain walk was one of the first in the nation. I’m proud of that, but I’m also tired. I’m taking time off of coordinating walks to enjoy Liam’s health and focus on other Children’s Heart Foundation work. Also, we lost our dear friend, CHD survivor, and walk co-founder Dr. George Warren back in April. This walk is dedicated to George’s memory. I’ve never actually walked the whole heart walk. I’ve always been literally watching the money-box. Next year I’m going walk it instead of manage it. But this year, my last year, I’ve got a few thousand dollars to raise in only one month to meet last year’s $25,000! This year, I hope you’ll support the walk and cheer when Liam finishes the 5K and kicks his heart back into sinus rhythm. Today my son is doing well. Tomorrow may be different. Today fathers and mothers will bury children because we have no cure for CHD, only treatments. Tomorrow, with the research we’re funding, maybe the next child will be a rock star and go on living, whereas once she would have gone past the edge of forever. Every Day. Every dollar. Every Doctor we fund to find the answers builds a foundation of research and practice that is less slippery, less tentative, and more hopeful. Every step we walk moves us toward saving more lives. Every single research dollar is the texture we need to grip and hold on to our hope. Please help me hope, not just for me and Liam, but for the kids and moms who need more hope. I’ve got a lot, but you can help it go further. Please support the Rocky Mountain Congenital Heart Walk today and help save lives through medical research and patient education. 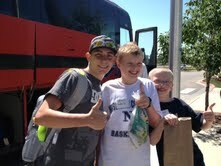 Liam leaving for heart camp with friends Nathan and Ethan. The money we raise today will give them more tomorrows.